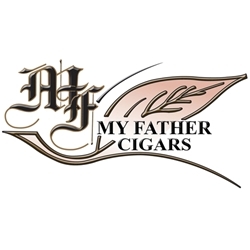 My Father Cigars are the hand-rolled premium cigar creation of well-known cigar legend José "Don" Pepin Garcia. The various styles offered here at our online cigar store are constructed at the Garcia cigar factory, known at the Garcia Family Industrial Park located in Estelí, Nicaragua. The production involved with creating each My Father cigar incorporates the traditional Cuban style cigar making, which draws cigar connoisseurs everywhere to this unique brand. Why? Because they love and appreciate a well-produced hand crafted rich and flavorful cigar that uses the finest tobacco leaf wrappers, binders and fillers from the regions of Nicaragua. If you looking for a great smoke at a great price, My Father are hand-made premium cigars that deliver time and time again. Smokers Discounts has made it easy and affordable to buy premium cigars online. Each of these styles, sizes and flavors are in stock and available at a low discount price. Call us for more details!